Most of the full-page pictures are divided into two or more panels. This one has a visual unity because of the coinciding symmetrical compositions of upper and lower panels. In the upper panel, Christ is shown displaying his wounds, as tradition said he would at his second coming. He is enthroned upon the heavens within a mandorla, or vesica-shaped field indicating that the figure is a heavenly vision. Two angels carry the mandorla. 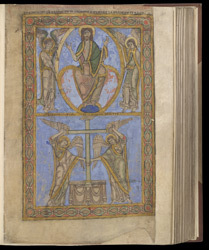 Below, two further angels support a jewelled cross, sign of the victory over death, before a sarcophagus-like altar, a double reference to the resurrection and the eucharist. This would have been the central image in a series of pictures showing the Last Judgement, with the saved to the right, the damned to the left.